Kimono Fresh Juice Recipes .Hearing kimono, of course we thought of the typical dress of Japan. However kimono that I will discuss here is different from the Japanese kimono clothing typical of the country because this kimono is a beverage. Kimono juice, this recipe which I will share to you. 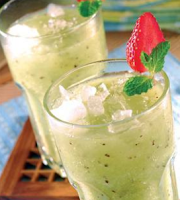 Kimono juice made from kiwi fruit mix, melon and lemon juice. It is suitable to drink during hot weather. 1. Squeeze the juice, mix with sugar water. Stir well and set aside. 2. Cut kiwi and melon, put in a blender, process until smooth. 3. Enter the orange juice into a glass, add kiwi, melon, and ice cubes. 0 Komentar Untuk "Kimono Fresh Juice Recipes"